Foolish Wisdom is an internationally syndicated column written by Bernard Toutounji. Foolish Wisdom is published in Australia various religious and secular mediums as well as on the popular American Catholic websites Ignitum Today and Catholic Mom. Selected articles have been published in print and online journals including The Daily Telegraph, The Punch, The Age, The Sydney Morning Herald, CathNews, Online Opinion, National Catholic Register, MercatorNet and Crisis Magazine. Foolish Wisdom is also recorded into online podcasts for Xt3 and Cradio. 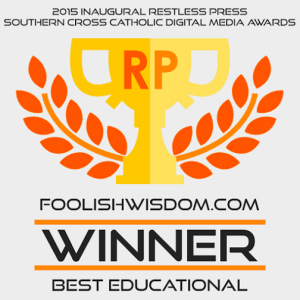 In 2015 Foolish Wisdom was awarded ‘Best Educational’ site in the inaugural Restless Press Southern Cross Catholic Digital Media Awards. Foolish Wisdom takes a contemporary issue within news, culture or faith and examines it afresh through the lens of reason and Judeo-Christian principles. The subline, “A Foolishness Wiser Than Human Wisdom” is taken from the Apostle Paul’s letter to the Corinthians where he states that the cross of Christ is foolishness to many, but that even the foolishness of God has a power and strength beyond the common wisdom of mankind. Paul asks “Where are any of our thinkers today?” and we could ask the same question. We live in an age of great advantage, but we have seemingly lost the ability to consider a position with reason and logic. Ours is an era of feelings divorced from objectivity. Foolish Wisdom seeks to ask the questions that will encourage readers to think for themselves. If you are interested in carrying Foolish Wisdom in your publication or website please contact us. If you are not associated with the media and would like to see this column in your local publication please contact the editor to tell them about Foolish Wisdom.